Ash Cave Is BIG—And Easy to Visit! 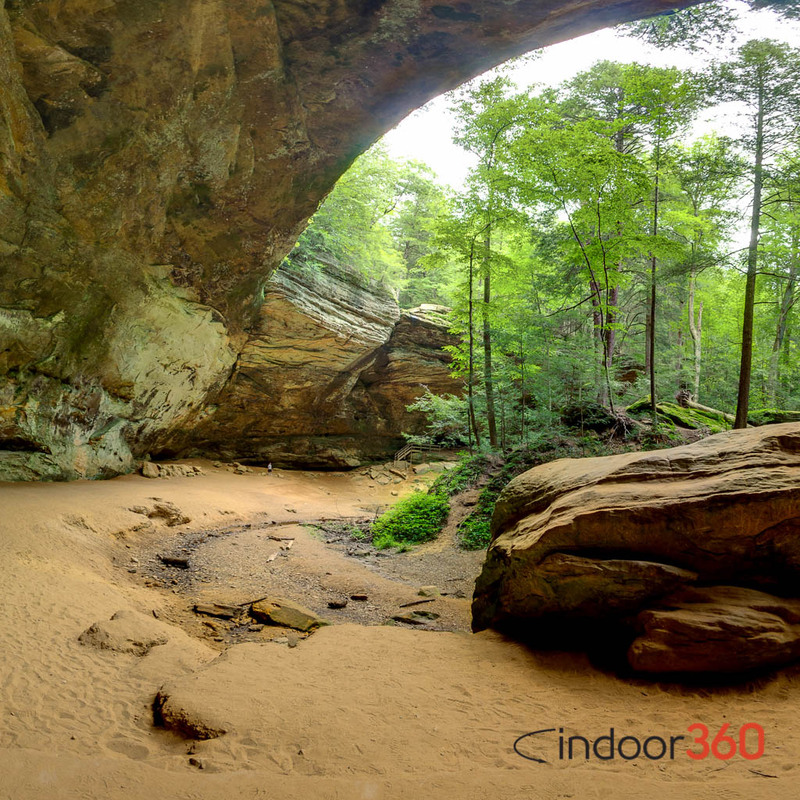 What you see in this virtual tour is Ash Cave, the largest recess cave East of the Mississippi. The first 360-degree panorama is at the end of a 1/4-mile concrete handicapped-accessible trail that takes you into the cave from the parking lot on State Route 56. The conveniently-located parking and the relatively flat paved trail make it easy for strollers, wheelchairs, and scooters to get up to the cave. At 700 feet wide and 90 feet high, Ash Cave is big enough to literally build a two-story house inside and still look enormous. The idea of living here may have been exactly how Ash Cave got its name, as early settlers found massive piles of ashes here, probably from campfires made by native tribes. The second panorama is near the center of the cave. Since these panoramas were shot in July 2014, you can see a pool but you don’t see the waterfall that fills it, as it often runs dry during summer months. You can also see the steps leading up to the top, and to the trail that runs along the rim of the gorge that leads to the cave. Ash Cave is on the southern end of the six-mile Grandma Gatewood Trail (also part of Ohio’s Buckeye Trail) connecting to two of Hocking Hills State Park‘s other top features, Cedar Falls and Old Man’s Cave. Needless to say, when you have someplace this special a mere three hours away, you want to take advantage of it. Since my return in 2012, Becky & I have been back to the Hocking Hills at least twice a year. In October 2014 and in June 2015, I shot several panoramas I plan to share here, which will give you an even better idea of why I love this place so much…so keep checking back! A width of 700 feet and a height of 90 feet makes Ash Cave the largest recess cave east of the Mississippi. A quarter-mile handicapped accessible trail leads from the parking area into the cave.